When you’re learning to drive you’ll doubtless spend hours and hours wondering what car you’ll end up with when you pass. Picking out your first car can be a difficult task, particularly when it comes to ensuring you get the lowest insurance costs. Safety is important, too, and so is fuel economy – popping £10 in the tank won’t get you far nowadays. It might seem sensible to buy the oldest, cheapest banger you can find, but financially it’s far from wise. Fuel and tax bills for older cars are higher, even on those with tiny engines. Additionally the insurance is likely to cost more, as is the increased amount of maintenance for worn out components. In this Data Bank feature we’ll show you – in no particular order - ten of the least expensive cars to buy, own, run and insure. The prices and information shown are for the current model, but recent used examples of the same vehicles can be bought for less, so shop around. The Spark replaces the Matiz, a car that was equally as inexpensive to buy and insure, but that was difficult to recommend to younger drivers purely because it lacked the pizzazz and sparkle, no pun intended, of its competitors. The Spark has more going for it, though. The interior is quirky, with a motorcycle style instrument pod above the steering wheel, and the exterior sports a more modern, angular look. It might not be as highly regarded as some of the cars in this list, but it’s the only one to fall into insurance group 1 (groups range from 1-50). It costs £30 a year to tax and can cover a reasonable 55.4mpg on the combined cycle. The C1 is closely related to the Toyota Aygo and Peugeot 107, both of which come from the same factory and cost roughly the same, so picking between them is down to personal preference. Whichever you like the best, you’ll still be getting group 2 insurance, extremely low emissions and cheap road tax of just £20 a year. It’s less practical than some of the five-door cars on this page, but there are plenty around on the used market, and there are some bargain deals on new models. Parking it up on campus or in the sixth form car park isn’t anything to be ashamed of, either. When you pass your test you’ll probably immediately want to give your friends a lift. It’s a rite of passage that every driver goes through when the L plates come off. With the Smart, you’ll have to give the lifts one at a time, though, because it only has two seats – which is its most significant downside. There are upsides, though. Firstly, it’s extremely nimble and easy to park, so even if you’re lacking confidence you shouldn’t have trouble finding a space. Secondly, it’s free to tax thanks to CO2 emissions of below 100g/km, which also makes it congestion charge exempt for those living in the capital. Finally, it’s the most efficient vehicle in this list, delivering an official claimed combined cycle economy of 67.3mpg. The Corsa is often a default choice for younger drivers. It’s abundant, being one of the most popular new cars on sale, and is relatively cheap to repair, maintain and run. The range is huge, though, with everything from expensive to maintain diesels to insurance unfriendly VXR performance models. If you’re stuck for which trim level and engine to pick, then look out for 1.0-litre Expression models. They’re not massively well equipped, missing out on even electric front windows, but they offer the lowest running, maintenance and insurance costs in the Corsa range. The three-cylinder TwinPort engine is driven by a cam chain rather than a belt, which saves even more money when it comes to servicing. Many younger drivers dream of the sleek lines of a SEAT – the Ibiza is a sporty looking car and you could be forgiven for thinking it’s going to cost a fortune to insure, but the 1.2-litre model in E trim is in a low group 3, and has all the good looks of its sportier siblings, albeit without the alloy wheels. Like many cars in this list, it’s not massively well equipped, but it does have most of what you’d need. There’s a CD player, electric front windows, height adjustable seats and a steering wheel adjustable for both rake and reach. The iQ is about the size of the Smart Fortwo, but benefits from a pair of rear seats. Quite how the Toyota engineers managed to squeeze so much space into such a small package is astounding. The boot is small, but besides that there’s little to fault with the iQ. It’s cute, small, economical, free to tax, and London congestion charge exempt. Unfortunately it’s quite pricey at £10,445 new. Two- to three-year-old models with average mileage are about £6,500 currently, but if you’re really after a car as small as this then the Smart is, for the moment at least, better value. Who’s to say you have to be 17 when you pass your test? Some people don’t learn until they’re in their 20s, and there’s every chance they have a small family by then. Even so it’s still important to have the same benefits as the rest of the cars in this list, albeit with the added benefit of increased interior space. Rather surprisingly the Fiat Qubo does exactly that. It’s based on a van, so offers a large boot and plenty of rear seat space. It does still look like a van, so you won’t win many style awards, but despite its bulky size it falls into insurance group 2. On the downside it’s bulky and heavy, and so the 1.4-litre petrol engine struggles to deliver the best fuel economy figures. Even so, 42.8mpg on the combined cycle is a decent figure for such a vehicle. The Pixo is available in Visia and N-TEC trim levels, both of which feature the same three-cylinder engine. In Visia trim there is very little in the way of creature comforts, with no electric windows, no remote central locking and no air-con. But if you’re after a completely no frills car then there’s very little on sale that’s as cheap as the Pixo, and it does benefit from low CO2 emissions of 103g/km, impressive combined cycle fuel economy of 64.2mpg and a practical, five-door design. The original Ka is enduringly popular with younger drivers and learners thanks to its cute looks, fun handling and reasonable reliability. The current generation model looks less unique than the previous model and instead seems more like a miniaturised Fiesta. That’s no bad thing though, and the Ka does hold a certain charm. Entry level Studio models are a little lacking when it comes to standard equipment, but, like all the cars in this list, it is cheap to insure, cheap to tax and cheap to run. A two-year-old model represents better value than a new model, and can be bought for around £5,000. The Volkswagen Polo holds a lot of appeal for many learners and young drivers – the Volkswagen brand holds a certain prestige, and the Polo shares its understated looks with more sophisticated models like the Passat. Unfortunately, Volkswagens are relatively expensive, and used models hold their value well. But for those who’ve come to realise the value that Skoda represents, the Fabia makes a sensible choice. Priced at almost £1,000 less than the equivalent Polo, the Fabia has the same engine and is very well built. Savings are even greater when you buy used. Sadly the Fabia isn’t as cheap to tax as some of its rivals in this list, falling into band E for VED, making for an annual bill of £110. Whatever model you choose to buy, whether to learn in or to drive after you pass your test, it’s best to consider the long term running costs as well as the initial price of the car. 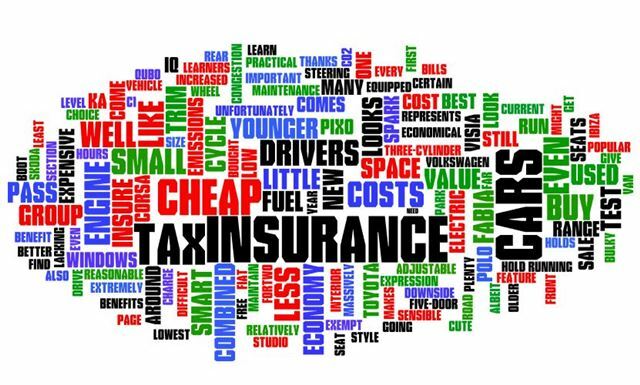 Over the course of a few years the road tax, insurance, repairs and fuel bills on older, less economical models could add up to more than you’re expecting. To search for your ideal first car, visit our cars for sale section. You’ll also find a host of hints and tips on passing your test and keeping insurance costs down on both the Young Drivers section and on the Facebook page. This is my honest opinion, that smart fortwo pulse micro hybrid car is worth for that price. Though it is small it has a good fuel efficiency power.